Ever since I began work on the refresh of the master floor of my house I’ve been considering something different for on my master bathroom sink. 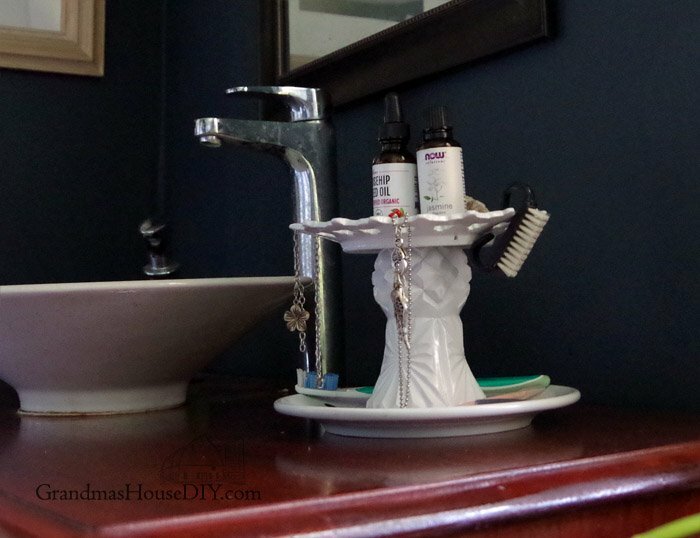 My little tooth brush holder had seen better days and then I saw this lovely project by Chas (one of my To Grandma’s house we go link party gals) and thought: I can make a two tiered stand for my master bathroom! 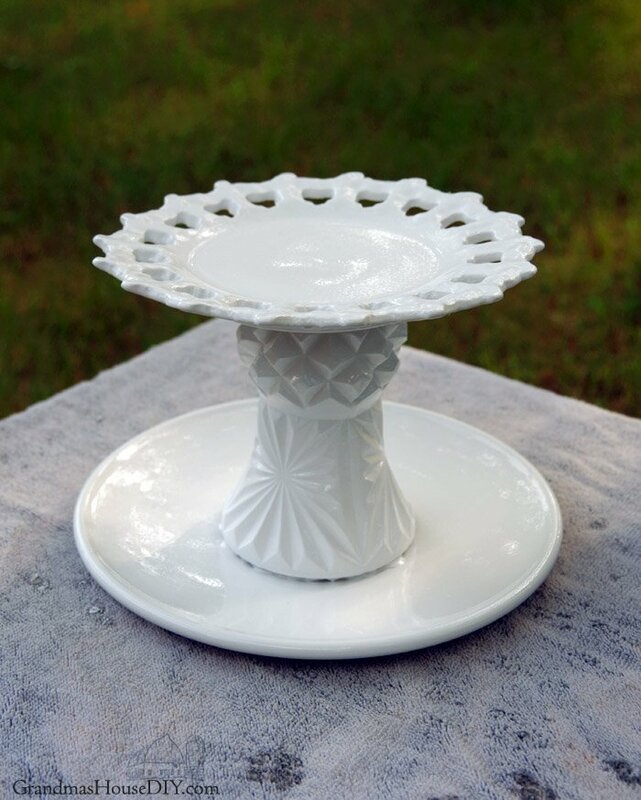 A trip to my local thrift store and I spent $3.75 on a couple of plates and a candle holder. 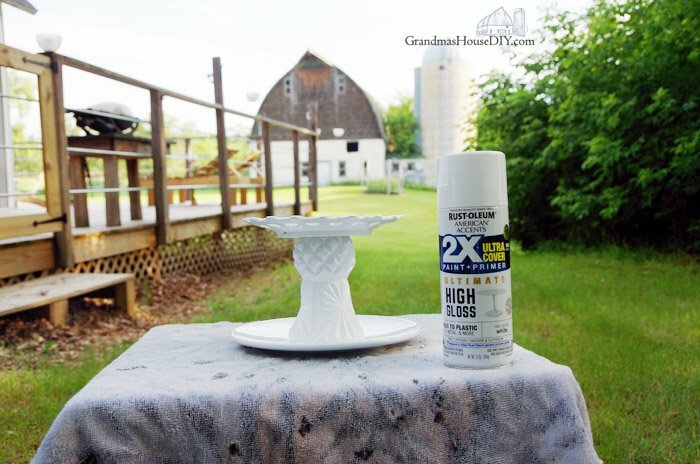 At walmart I picked up some gloss white rustoleum spray paint and Gorilla glue. I prepped the glass by washing it thoroughly in vinegar and water and then I lightly sanded all of the surfaces with a really fine grit sand paper. From there I washed them again, thoroughly dried them and then glued them together. I let them dry for 24 hours before spray painting the entire two tiered stand. 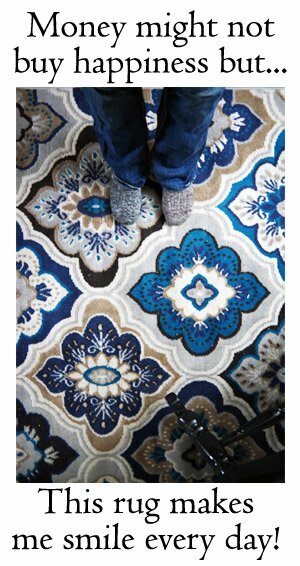 This was another idea I got from another of the awesome bloggers I’m friends with. 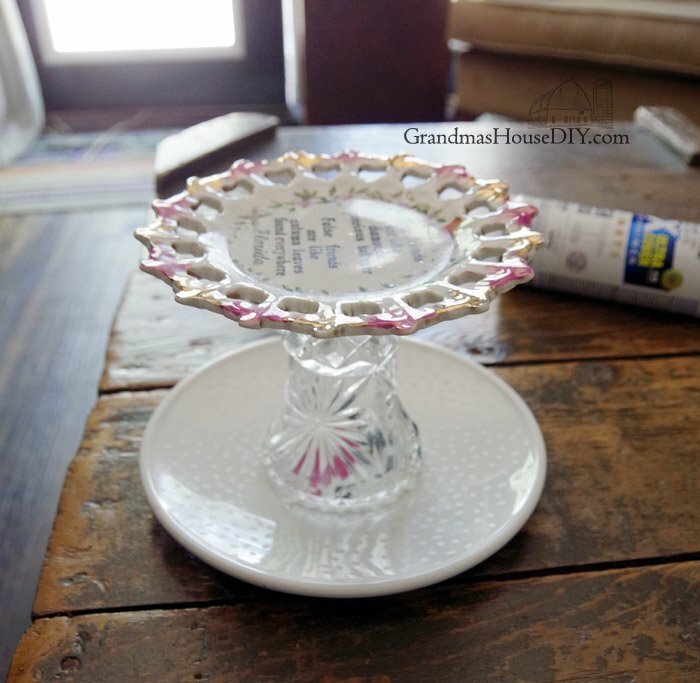 Michele over at Our Crafty Mom did a tutorial about how to make Faux Hobnail Milk Glass for our milk glass project through the Farmhouse Hens Decorate group I’m a part of. So I totally went for it with the white spray paint. I was really cautious to avoid drips so I did several light coats. Finished! And I totally love it! The unique rim on top gave me a perk I never even considered, it makes a great jewelry hanger! 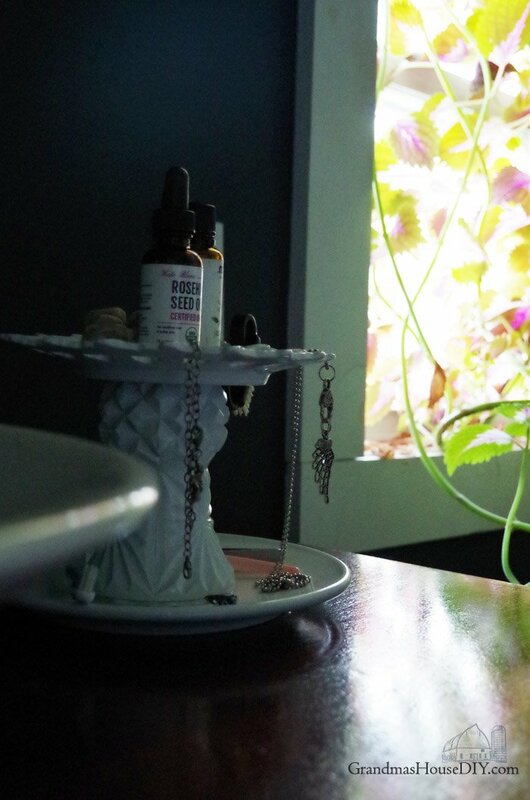 I use it for the items I reach for most often, the jasmine essential oil I use as a perfume, a few hair thingys (of course), my tooth brush and the essential rosehip seed oil that I use with my tinkle razor. All in I think it looks lovely on top of the buffet I converted into a vanity and beside my vessel sink. Tarah, Just brilliant! You are so creative. Love it. I am only just starting DIY, as you know, and now have the first project waiting to be started. My Giani Counter Top Paint kit is sitting here waiting for me to getup the courage to start on it. 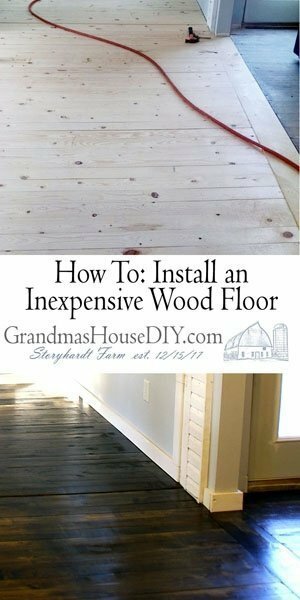 Then it’s stick on tiles for a backsplash, stuffing old love-seat cushions and covering laundry basket from the Dollar Store with jute. Oh, I shudder to start on my own. This first project will take a lot of planning, I think, clearing up the kitchen to start with and making room on the counters to start. My long-term dream is to renovate my very old, warped kitchen cabinets in my also very old mobile home. Can’t think that far ahead, though, and don’t think I could ever find the energy. I have ordered your newsletter and look forward to reading it. Keep up the good work. Its really good to hear from you Sally! The one basic fact I keep reminding myself of over and over again is that slow and steady really does win the race. So many times I get to feeling frustrated by my own slowness – I just never feel like I get anything done as quickly as I would like to. But, that’s not the point, the point is just a little at a time and you will get there! And totally the end result is ALWAYS SO WORTH IT! Thanks Michele! I love how useful it turned out to be! This is awesome! 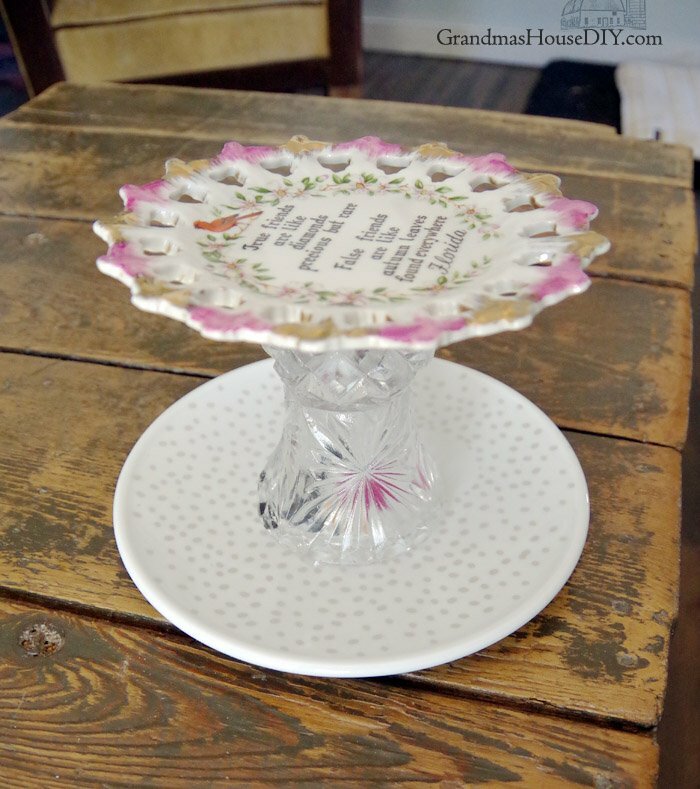 The holes in that plate that you put up top make it super functional. 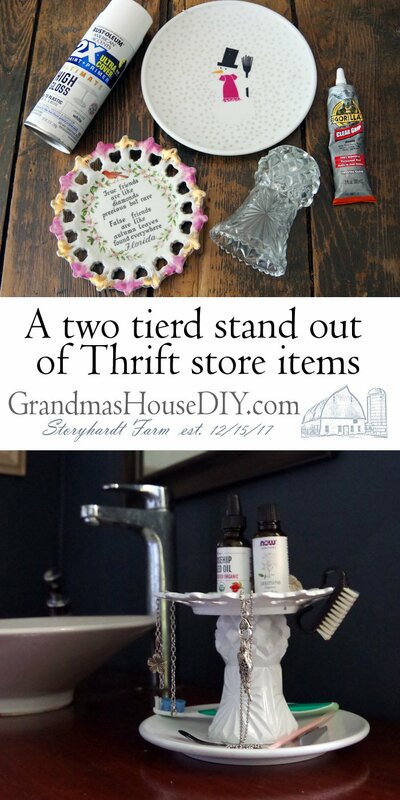 I love thrifty ideas like this, I am going to pin it for sure! Thanks Marissa! Yeah that plate turned out making it really fun and useful! I agree with Marissa… the functionality adds 100% more ‘love’ to the project! Really nice! Thanks for sharing! Thank you Julie, the design of that plate was definitely a functionality perk I didn’t see coming! 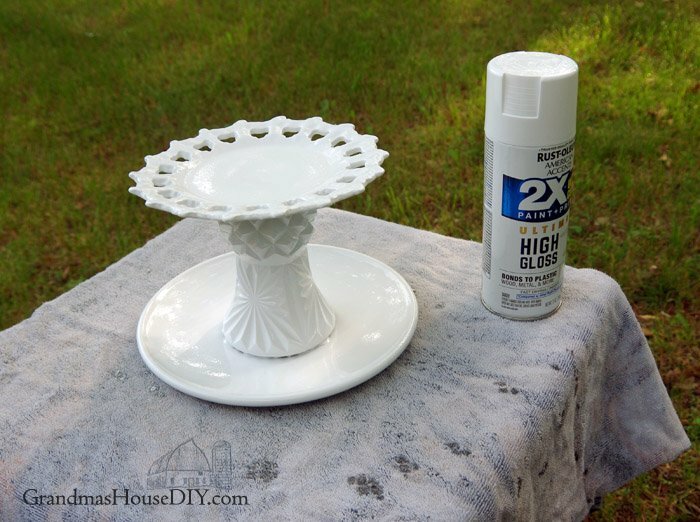 Great idea and amazing what a coat of spray paint will do! 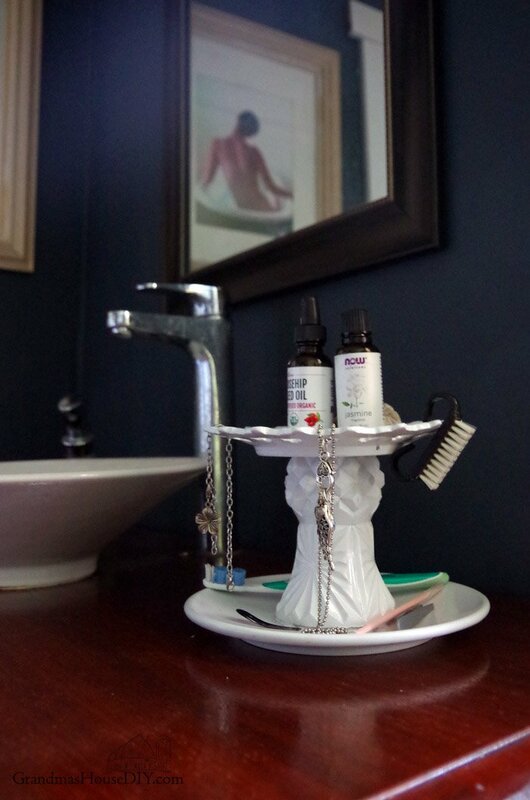 If my kids were older (and a little more responsible), I could see something like this for all my daughter’s trinkets that usually wind up in the bathroom! Visiting from Happy Now party. Thank you Victoria and SO true, spray paint is miraculous! 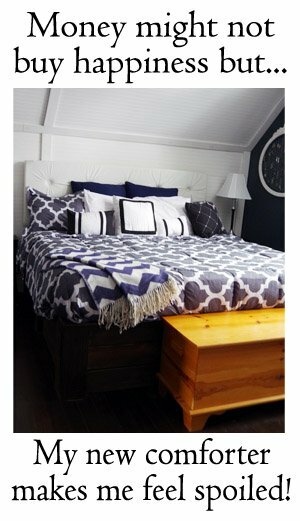 I just luv two tiered stands and this one looks so fun and easy to make! 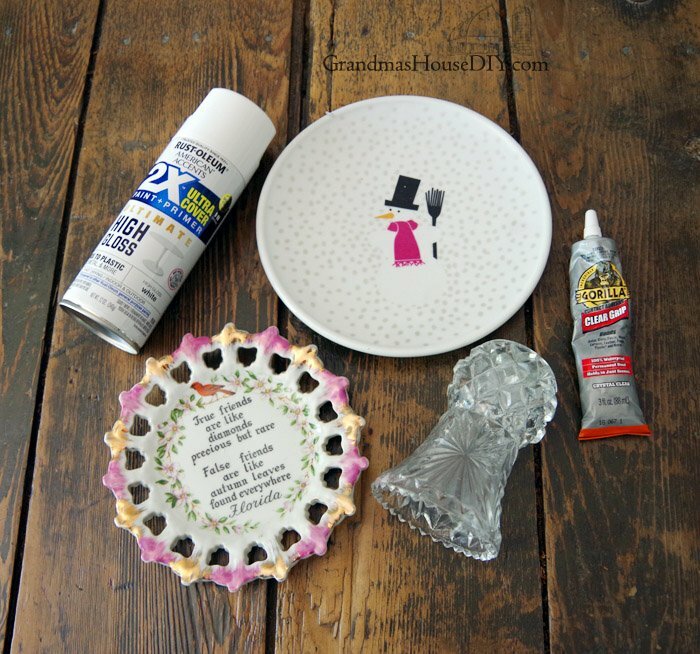 I’d luv for your to share it with us at Wall to Wall DIY Wednesday too! !